The most rewarding part of our day is seeing you being dazzled and enthralled by your own home. We're glad to play a small part in that. We truly appreciate your expressions of thanks." -- Chris & Elena Kinny, Owners and Sole Workers at Cyclone Cleaning Services, LLC. "We could not have been more pleased with the service you provided. We have hired window cleaners in the past, but none has gotten our windows as meticulously clean as you did. I believe it’s a combination of your very conscientious manner, skill, knowledge and your state-of-the-art window and screen washing equipment; plus good old-fashioned elbow grease where necessary. We love that you were also able to repair our ripped screen on site. Thank you for the high-definition view we’re now getting through our windows." 1/24/15 - Patricia H, Downtown Frederick MD. "I was very pleased with everything Chris did. He was very helpful with the screens, even cleaned them. Also, showed me how some of them would not fit in the windows that had shifted. He was professional while being very personable. I certainly would recommend him to anyone!!!!!! Thanks so much my house is sparkling now!!!!" 11/11/14 - Linda O, Frederick MD. "I thought the service and attention to detail was great, I would highly recommend Cyclone Cleaning!" 10/31/14 - John L, Urbana MD. "Looks great – thank you for a job well done"
10/22/14 - Barbara B, Frederick MD. "Very satisfied with your service, will freely recommend you to friends, have done so already here in the office." 9/16/2014 - Michael M, Worman's Mill MD. "Thanks Elena. It was a pleasure working with you and Chris this week. The siding and windows look fantastic!" 9/11/2014 - Neil H, Adamstown MD. "Chris, Your service was excellent, outstanding! My wife, her sister & I are all highly pleased. We've been enjoying vistas we had forgotten existed." 9/9/2014 - Richard W, Downtown Frederick MD. "We are very happy and please with the work that Chris did on our house!!!! We will be calling back next year!!!" 7/1/2014 - John F, Frederick MD. "Dear Chris and Elena, it was wonderful to meet you! I am so pleased with how beautifully clean the windows and doors are." 12/9/2013 - Wendy M, Frederick MD. "Chris, the service was superb. Every window sparkles like a polished gem! Thanks for your hard work, and we will look forward to seeing you in the spring." 9/22/2013 - Jack A, Middletown MD. "Chris and Elena did a fantastic job! They were very courteous and worked efficiently and meticulously. They were very careful when handing screens and window grids. We now have sparkling clean windows for the first time in more years than I want to admit. We highly recommend them. Thanks, Cyclone Cleaning Services, for a meticulous, courteous, and matchless job!" 9/13/2013 - Bill C, Frederick MD. "Thank you so much for cleaning our windows! I am absolutely thrilled with the results. You are such a wonderful, pleasant couple to do business with. We will definitely call you back again." 7/4/2013 - David & Steph H, Martinsburg WV. "The repaired screens look great. Cyclone’s service was prompt and professional. 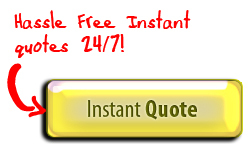 I am happy to recommend Cyclone Cleaning Services based on my experience." 5/29/2013 - Mike M, New Market MD. "I am enjoying my sparkling clean windows. Even my husband noticed and said that he had never seen them that clean. Thank you and I will use you again and recommend you to friends and neighbors." 4/24/2013 - Pat L, Frederick MD. "You both did a fantastic job; I had not cleaned my windows since we moved into our home 7 years ago (and you could probably tell). The house sparkles and the sunlight just pours in! Thanks for doing a great job." 4/23/2013 - Maryellen M, Frederick MD. "Chris, you and Elena did a great job! I appreciate how hard you worked and the professional and caring way you approached the task. Our windows are sparkling and I couldn't be happier. The lesson for me is to keep up with it. So I will be in touch next year for another cleaning! Thanks too for tackling the foyer light - it looks new again. LOL!" 12/12/2012 - Lee Ann N, Frederick MD. "My wife and I hate to clean windows, so we were very satisfied when we received the mail flyer on this company. We have tried other window cleaning companies before, but they rushed through the job. This company did not. They took their time and meticulously cleaned each and every window to our satisfaction. I will be letting the people in Urbana know that this is the company to go to." 10/17/2012 - Arthur C, Urbana MD. "Chris was great to work with. He and Elena were the utmost professional team I have seen in a long time. Their demeanor, appearance, and workmanship were exceptional. 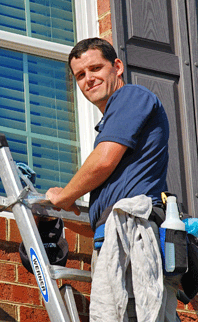 We will definitely call them when it is time to have the windows done again." 9/10/2012 - Ed C, Urbana MD. "Our windows look spectacular, they just sparkle. We were impressed with the whole process: you were very prompt about giving us an estimate, you arrived exactly when you said you would, you quickly and quietly got on with the job and were done in no time. We liked the little touches such as covering your shoes so as to protect our floors and sweeping out around the window frames. It was a pleasure to meet you both, too. Thanks again." 8/10/2012 - Lesley S, The Woods - Hedgesville WV. "Chris and Elena, how wonderful and clean the view was from inside our house this morning when daylight broke. Never, never have I seen windows so clean – not just in this house but in the house we owned in Northern VA and in other houses. The two of you have a magic touch like I have never seen before. I do not have any idea how busy you are but I plan to tell everyone I know about you. People visiting this house will be so amazed." 7/13/2012 - Susan R, Charles Town WV. "We are completely impressed with Cyclone Cleaning Services and Chris. He came into our home and the first thing he did was put on shoe covers. He set to work and by the end we had beautifully cleaned windows and screens. He is the most polite person and completely professional working meticulously for excellent results. Now, when the sun shines through there are no smears, no dirt, nothing, just bright clean windows. We had a moment’s pause as we rehung the curtains thinking it is a shame to hide the windows!! Thank you Chris. We will see you again next year." 6/16/2012 - Leslie G, Frederick MD. "Chris was a joy to have in my home. It was a rainy day and I didn't think the windows would look very good. He assured me they would be fine. My windows are beautiful. It has been a couple of weeks, several storms, and they still look great. He was very professional, courteous, and friendly. I highly recommend Cyclone Cleaning if you want your windows to sparkle and at a very reasonable price. Thanks Chris for a great job." 6/6/2012 - Micki. F, Martinsburg WV. "Chris did a thorough and professional job. Nothing in the house was disturbed. The windows were sparkling when he was done. Also very pleasant; we chatted some as he worked. I heartily recommend him." 6/4/2012 - Michael D, Damascus MD. "Chris was very prompt and professional. I felt completely comfortable with having him in my home. My 16 year old windows look brand new. We will be contacting Chris in the future for help with our windows." 5/29/2012 - Ginny B, Windsor Knolls - New Market MD. "I have never had my windows cleaned before - I always did it myself, a window at a time, over a period of many weeks because I never had a long block of time to devote. When I saw the ad from Cyclone with a coupon, I decided to give it a try. What a spectacular decision! My windows look like new. Chris was very professional. He did a great job. He is a perfectionist, redoing a window that was not up to his standards when it looked just fine to me. My windows are sparkling clean! I will never bother trying to clean them myself again - I will call Cyclone. Great value for the money." 5/2/2012 - Debbie K, Spring Ridge - Frederick MD. "Outstanding. Super flexible, the windows look amazing, and the service is great. Will probably do this every year from here on out." 4/17/2012 - Eric T, Holly Hills - Ijamsville MD. "I was more than pleased with the professionalism and character of Chris Kinny. He worked continously and with respect for my home. He explained his technique and any problems he encountered with my old and stained windows. I felt completely safe and comfortable with him in my home. His results were sparkling and I have already referred him to two of my friends. It was a pleasure dealing with Cyclone Cleaning Services." 4/15/2012 - Jeanine Y, Holly Hills - Ijamsville MD. "Chris works SO hard - he doesn't stop until the entire job is perfect! What a pleasure it is having CLEAN windows again!!!! You won't regret hiring Cyclone Cleaning Services!!!" 4/15/2012 - Danielle G, Holly Hills - Ijamsville MD. "Cyclone did an excellent job, especially on reaching and cleaning difficult, high windows and glass hanging lights. All surruounding sills and woodwork of windows, as well as screens were done well also." 4/12/2012 - Roberta A, Charles Town WV. "Chris did a perfect job! I have more than 30 windows in my house, and he worked on each one of them! Screens included! He was fast and very easy to talk to! I will definitely hire him again next year!" 4/9/2012 - Adriana T, Shepherdstown WV. "The sun is shining in! Thanks Chris, everything looks great!" 4/2/2012 - Angela M, Spring Ridge - Frederick MD. "When I arrived home from my business trip, I was thrilled to see howclean my windows were! If I had to pick one word to describe the service and quality, it would have to be "AWESOME." I will definitely use Cyclone again and would definitely recommend your services to friends and family (and will). My husband (who was home during the cleaning) was impressed, not only with the quality of the service, but also with your professionalism, consideration, and courtesy. THANK YOU so much for your excellent work." 11/25/2011 - Tina B, Clover Hill - Frederick MD. "Chris arrived on schedule and provided a better than excellent service on windows in my house which had not been cleaned for ever - the house has been rented out for 5 years! Very professional and courteous and I would thorougly recommend his work to both residential and commercial clients. Thank you Chris!" 11/9/2011 - Christina C, Charles Town WV. "Chris arrived right on time and got to work immediately. He was very polite and friendly. I think I had a few more windows than he thought, but he toughed it out. The quality of the cleaning was excellent. I had my carpets replaced recently, and he was very careful to avoid soiling them. He wore shoe covers and used drop cloths. He even tried cleaning up dried cat vomit from one window sill, until I told him it wasn't his responsibility. I couldn't be more pleased with the results. I even paid him more than the estimate, although he was willing to stick with it. But I thought he deserved a bit extra. I am not used to such excellent service. I recommend this service very highly and without any reservations at all. Just super all around. Thank you Chris! I'll definitely be calling you to clean the windows in my new home." 9/29/2011 - Dave W, Dearbought - Frederick MD. "I had Cyclone Cleaning Services come out and clean over 30 windows that had not been cleaned for at least 3 years. It was an absolute miserable day with 100% humidity and rain that was off an on all day. Even though it was a miserable day, I still wanted the windows cleaned. Chris was very professional and the most considerate contractor I have ever hired. Even though it rained non-stop, my windows are sparkling and Chris was an absolute joy to work with. Thank you again!" 9/25/2011 - Linda D, Urbana MD. "VERY thorough and it brightens the house. This is a GREAT investment." 8/22/2011 - Al O, Hedgesville WV. "You came when you said you would come and did what you said you would do. The result? 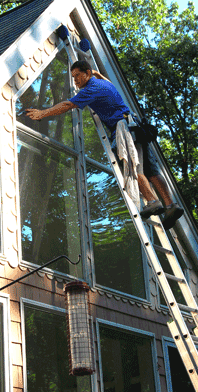 Excellent clean windows, screens and storm windows. We are very happy to recommend your service to others. Even the Handyman we hired to fix the rest of the house was impressed with your service and I would not be surprised if he calls you for a job he is working on at some time. Thank you for a job well done." 8/18/2011 - Paige M, Hedgesville WV. "Just wanted to thank you for doing such a great job on our windows yesterday. I feel like I'm seeing the world in HD today." 7/29/2011 - R.S, Kingsbrook - Frederick MD. "Excellent job! I am really tickled with how wonderful the windows and screens look, and will be singing your praises to everyone I know. Thanks again, and see you... [at the next appointment]!" 7/23/2011 - Karen B, The Woods - Hedgesville WV. "Very close attention to detail. Great job." 7/7/2011 - Kevin M, Clover Hill - Frederick MD. "Chris was on time, courteous, and professional. I like that he did not use rags and Windex like the last company I hired. My windows look great! Overall, I was very satisfied and would hire him again. I will recommend him to my friends and neighbors." 6/12/2011 - J.A, Frederick MD. "Our windows sparkled after they were cleaned. The job was well done - handled professionally from beginning to end. We were very pleased." 6/11/2011 - Wendy B, Frederick MD. "Thanks for your excellent window cleaning service yesterday! The windows are really clean. What a change! You managed to do it with great discretion and efficiency, and also at the right price." 5/14/2011 - Bernard G, Frederick MD.